The Baroque Guitar was common from the beginning of the 17th century to the late 18th. 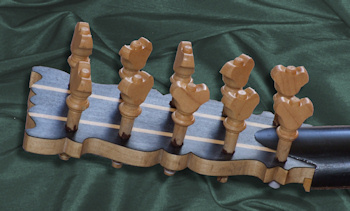 It has five double-strung courses. There is a substantial solo repertoire in tablature, but it was also used as a continuo instrument, improvising from figured bass, and for simple strummed accompaniments. The basic tuning is aa d'd' gg bb e'e' - the fourth and fifth courses are re-entrant. Two other tunings were commonly used - a low octave string on the fourth (aa d'd gg bb e'e') or on both fourth and fifth (aA d'd gg bb ee). Fortunately, changing tuning only means changing strings, so players are free to experiment. My baroque guitars are based on plans of the Stradivarius in the Ashmolean Museum, and another in a private collection in Birmingham. 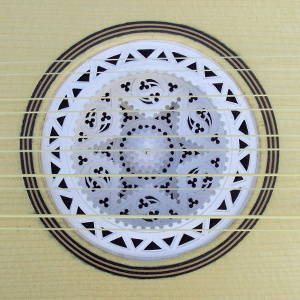 A prominent feature of the Baroque guitar (appropriately) is ornament. 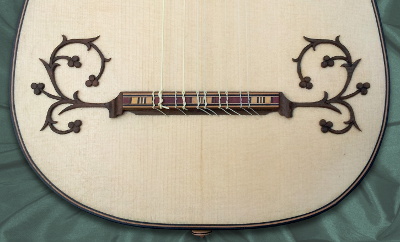 There were relatively plain examples, but many of the surviving baroque guitars have LOTS of inlay, deep multilayer roses, moustaches on the bridge, and all sorts of other frippery. Prospective purchasers will need to decide how much decoration they want. The pictures on this page show my standard model, which is decorative without being gaudy - nothing like the encrusted examples in some museums. From Richard's new album "Tombeaux - a secular requiem for my father". 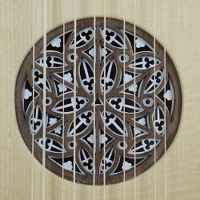 Baroque Guitar, as in the pictures above - deep rose, bridge moustaches, edge banding, inlaid head. More or different decoration - tell me what you want and I'll work out a quote.